7 days from $1,895 — Prices based per person sharing (Single Supplement available). When golfers think of Ireland it is the legendary courses of the South West that come to mind. With Ballybunion, Dooks and Tralee among the best links courses anywhere there’s so many great reasons to come golfing to Ireland’s South West. We invite you to take this rare opportunity to enjoy the best golf Ireland has to offer at an exceptional value. 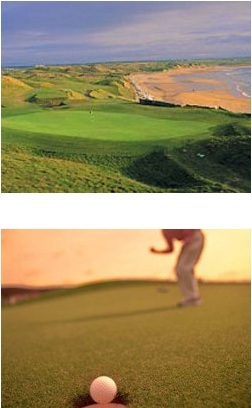 The very name Ballybunion Golf Club, strikes a chord with golfing enthusiasts around the globe. Rated one of the ten best golf courses in the world, standing on the first tee at Ballybunion Old is every bit as awe inspiring as one could imagine. Designed by legendary course architect, Robert Trent Jones Sr. and opened in 1980, the Cashen Course at Ballybunion is more than entitled to share the same hallowed turf as the Old Course and is a superb test of links golf in every respect. That some consider that the Cashen Course presents a stiffer challenge than the Old Course, speaks volumes for its quality. Representing the first European design of Arnold Palmer, Tralee Golf Club is one of the most spectacularly beautiful golf courses you will ever encounter. Having completed his masterpiece, Palmer commented: “I have never come across a piece of land so ideally suited for the building of a golf course. I am happy that we have one of the world’s great links here”. The golf course is set out on one of three stretches of sand dunes at the head of Dingle Bay providing a beautiful and tranquil environment to enjoy good golf. Hole number 13 best illustrates the charm and magic of Dooks. It is a throw back hole to the time when golf began. Greens lay where they fell and were better for it. The Dingle (Ceann Sibeal) championship Links course is the most westerly golf course in Europe. The views from the golf course are astounding. There is a winding “burn” throughout the course, which adds to it’s uniqueness and catches more than it’s fair share of errant shots! We also suggest Waterville, Lahinch, Doonbeg and Old Head if you wish to play additional courses. 6-nights first class hotel accommodations. Upgrade to the services of a Professional Driver/Guide, luxury car or van, including all driver expenses. Taxes & Service charges in Ireland. Services of our offices while traveling in Ireland.